UMP | University of Minnesota Press Blog: Uncovering the brave women behind mental-health reform in Minnesota. Uncovering the brave women behind mental-health reform in Minnesota. In the past two years, the Women's March and the #MeToo movement have given voice to demands for gender equality. These claims are part of a long history—from suffragists marching for the vote to the cry of feminists in the 1960s and 1970s for equal opportunity. While women have long fought for opportunity and recognition of their contributions, many of their stories have not been told. 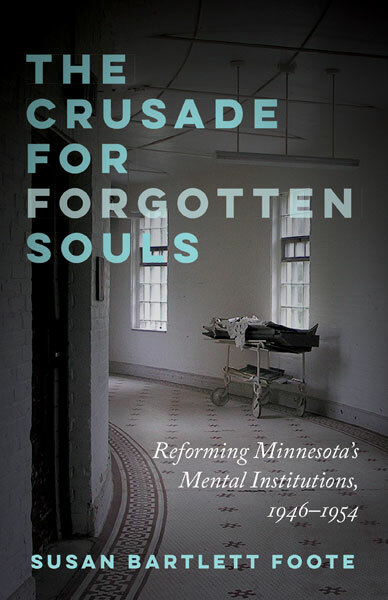 The Crusade for Forgotten Souls: Reforming Minnesota's Mental Institutions 1946–1954 tells the story of a statewide social movement to reform the abject conditions for 15,000 Minnesotans in the seven mental hospitals and the school of the "feeble minded." When I began the research, I learned that in this little-remembered period of Minnesota history, Governor Luther Youngdahl, a Swedish Republican with a big heart, gets most of the credit (though a few accounts acknowledge the role of the Reverend Arthur Foote (my former father-in-law, who passed away in 1999) and Dr. Ralph Rosen). As I dug deeper, I learned this was not the whole story. When I read Youngdahl's biography, a name caught my eye: Engla Schey. The biographer wrote that Schey "started it all." Nothing more about her. Who was she? I searched for clues in public records—census documents, local newspapers, city directories. She was a poor farmer's daughter, unmarried, with a long stint in Salvation Army, and on the roster of low-paid attendants at Anoka State Hospital in 1940. How did Schey start a social movement? Through a wonderful stroke of luck, I located a descendant who had Schey's diaries and other writings. She sprang to life. In response to her own father's mental illness, she wanted to help the mentally ill. She "crashed the gates" at Anoka and was horrified at what she found. She tried to improve care from within, but was blocked at every turn. Despite disdain from professionals, she became a fearless crusader. At a fortuitous meeting of Unitarians interested in mental-health reform, she spoke up passionately, and the Unitarians took up the cause. Our second important woman in the story is Genevieve Fallon Steefel. She and Schey met at the Unitarian conclave and corresponded during the reform effort. Unlike Schey, Steefel had status. She was a graduate of Radcliffe College, wife of a respected professor, and active in many social causes. Her public life was accessible because her husband had donated her papers to the Minnesota Historical Society after her death. But, once again mining public sources, I learned more about Steefel than her papers conveyed. She was the child of Irish immigrants in Boston, her father died when she was six, and she was raised in poverty by her grandmother. Where was her mother? She spent years in Worcester State Hospital. A brilliant student, Steefel's social worker found a way to get her to Radcliffe College. Steefel reinvented herself. Within five years, she graduated with honors, had a year on a fellowship in France, moved to Minnesota and married the professor. She buried her tragic past but carried forever deep in her heart a drive to help unfortunates, less from noblesse oblige than from an intimate knowledge of true misfortune. Steefel became secretary to the Unitarian committee—a role often given to women who were expected only to take and transcribe notes. Steefel did much more. She wove detailed reports used at every stage of the reform effort. She consulted experts, organized meetings, prepared witnesses for hearings, and wrote testimony. She stepped out of the shadows to write several blistering editorials under her own byline. Arthur Foote was the important public face, but Steefel was the substance and discipline behind it. Our third hero is Eva Jerome, a 70-year-old social worker. Jerome's family valued education, and she was one of the first women to graduate from the University of Minnesota in 1899. Her family belonged to First Unitarian Society in Minneapolis, a hotbed of activist feminists involved in women's suffrage and birth control. Jerome was a practical woman. She saw a need and responded directly. She formed the Unitarian Visiting Committee and mobilized volunteers to work with patients. Over time, the cadre included many other church and service groups, and in one two-week period, more than 100 volunteers visited patients; organized parties, musical programs, and movies; and offered sewing, typing, and art classes for men and women. In addition, social workers in the congregation designed and taught formal training for volunteers. Jerome's daughter Ida Davies published Handbook for Volunteers in Mental Hospitals (University of Minnesota Press, 1950) to disseminate their findings that laypeople can positively affect patient outcomes. Last but not least was Geri (Hoffner) Joseph. A young Jewish woman from St. Paul, Hoffner was the managing editor of the U's Minnesota Daily from 1945-46. She aspired to be a journalist and chose the Minneapolis Tribune when offered a chance to do in-depth stories. She had been at the paper little more than a year when Foote approached her with the idea of a story on the mental institutions. Hoffner's editor advised her to inform the governor of the plan. When Hoffner told him, Youngdahl bellowed: “If you try to do this, I will have your job!” (You will have to read the book to find out why Youngdahl, the reformer, threatened the reporter.) Her series, "Minnesota Bedlam," was a powerfully written 11-part series accompanied by heartbreaking photographs. The story mobilized the public, which was essential for Youngdahl's 1948 re-election, and strengthened his hand during the legislative session that made reform a reality. The Crusade for Forgotten Souls was the work of many people, men and women. The contribution of these talented and committed women was pivotal to the reform's success. The research process revealed the challenges of documenting their women's contributions that were often unacknowledged at the time. Their legacy is an inspiration to all of us. Susan Bartlett Foote is professor emerita in the School of Public Health at the University of Minnesota, where she was head of the Division of Health Policy and Management from 1999 to 2005. 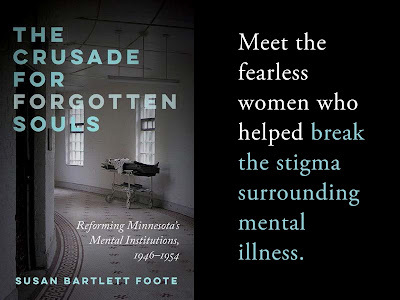 She is author of The Crusade for Forgotten Souls: Reforming Minnesota's Mental Institutions 1946–1954 (Minnesota, 2018) and Managing the Medical Arms Race: Innovation and Public Policy in the Medical Device Industry. 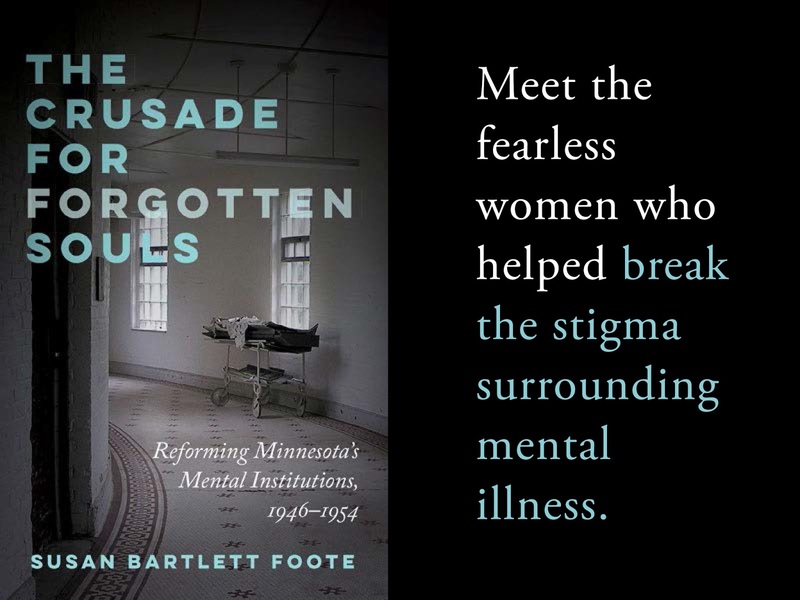 "In a wondrous feat of research and storytelling, Susan Bartlett Foote has distilled personal accounts, public and institutional records, and newspaper coverage to dramatically detail Minnesota’s mental health reform of the last century. Her narrative is harrowing and inspiring—a tribute to the difficult work of countless people, many of them outraged ordinary folk, who challenged the horrors of a stubborn and intractable system." The End of Man, One More Time.